if:book Australia promotes new forms of digital literature and explores ways to boost connections between writers and audiences. if:book Australia is a small think-and-do tank which is part of the Queensland Writers Centre. We are linked with an international fellowship of organisations exploring book futures with the Institute for the Future of the Book in New York, founded by Bob Stein, and if:book London led by Chris Meade. A special event series presented by if:book Australia and the Australia Council for the Arts, exploring digital futures for Australian authors. For years authors and publishers have been told “digital is coming”. Now it’s here! But what does this mean for authors? 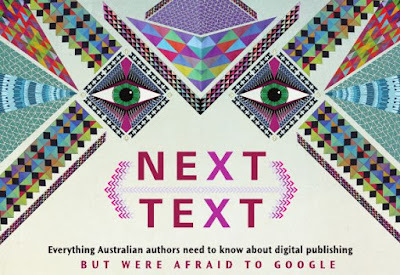 Next Text is a national seminar series in 2010 to help Australian writers explore how digital media is changing publishing and where the opportunities are for writers. Next Text will feature a variety of guest speakers, including international guests Chris Meade, Richard Nash and Hugh McGuire. A conversation on e-books, digital print, distribution, new kinds of writing and business models for writers and publishers. You may not care about e-books or gadgets, but you probably do care about how even the traditional publishing model is being altered by cultural and technological change. This session will explore these ideas. New publishing business models mean new ways for you to licence, distribute and sell your content. This means changes to your traditional publishing contracts, but it also means new ways to think about how you might earn income from your writing. Explore emerging issues and opportunities authors are facing when licencing their work to publishers and other companies, or selling direct to audiences. So, you’re a writer and you’ve got a website. You might even have a blog and a bunch of Twitter followers. But how do you really drive your online platform from there? Explore the marketing and social media concepts that can help authors drive their relationship with readers.